Acid Mothers Temple - "Mantra of Love"
I’m a big fan of Acid Mothers Temple and the whole Acid Mothers Soul Collective, so it comes as a bit of a difficulty to give a less than stellar review to one of their albums. First, let me say, Mantra of Love is another great release from AMT, and has everything we’ve come to expect from them. Therein lies its problem. As much as I enjoyed Mantra of Love, it all sounded just a little bit too...familiar. Though admittedly, I have only listened closely to this one twice now, and even on the second listen, I found I uncovered a few more sonic layers and found new things to hear, so perhaps this is the kind of work that will reveal itself to be a classic with the passage of time and more listens. There are just two tracks. Things kick off with the 30-minute long La Le Lo. In the tradition of La Nóvia, this is another AMT style rendition of a traditional Occitan piece. Occitan, for those who are unaware, is the indigenous language of southern France, which thrived mainly from the 11th to 15th centuries and had its own literature and artistic traditions, including the medieval troubadours. Kawabata Makoto has long had a fascination with the folk music of this culture. Over a gentle acoustic opening, Cotton Casino sings the melody in a vaguely operatic style, somewhat reminiscent of Soleil de Cristal et Lune d'Argent from 2002’s Univers Zen Ou De Zéro à Zéro. Nonetheless, when the jam kicks in, it’s a good one, electrifying the traditional melodies in the same way the band did on La Nóvia, with spacey synths adding tasteful touches of cosmic noise, rather than being all over the place. For the most part, it’s fairly restrained, and even tends towards more melodicism than most AMT releases, especially their more recent rip your face off chaos jams (and so it stands as a direct contrast to their other Alien8 studio release, Electric Heavyland). Tsuyama Atsushi’s monster bass is in particular fine form throughout. After a second, more haunting reprise of the main theme, the jam kicks in full force again, eventually dissolving into a sea of cosmic noise and feedback, and finally ending in a nice, spacey acoustic coda. The 15-minute long L’Ambition dans le Miroir is a piece written by the band, again featuring Cotton Casino’s beautiful vocals (considering she is constantly credited with “vocals, beer, and cigarettes”, her voice is certainly pure and crystalline). The setting for this piece is spacier and quite dreamy, with lots of tinkling windchimes, ghostly (and often quite melodic) synths, and acoustic playing, though eventually, the heavy guitars do come into the mix. During the slightly heavier parts, it reminded me a little bit at times of Kawabata’s Rebel Powers side project. For fans familiar with a lot of AMT’s music, I’m sure, just like me, you’ll want to pick this one up, though you may find it sounding a little familiar at times. On the other hand, if you’re new to the Acid Mothers Temple, Mantra of Love is an excellent place to start, being a little more accessible and melodic than some of their other releases. Rather than being a total freakout this time, Mantra of Love is more hippy trippy music for the 21st century. Mellow...but not too mellow, of course. 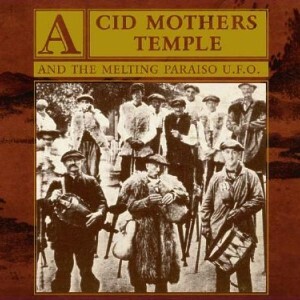 Visit the Acid Mothers at their website: http://www.acidmothers.com. For more info, visit the Alien8 website at: http://www.alien8recordings.com.